Look different, look unique on your special wedding day. This fascinating traditional set includes everything you need for jewelry. 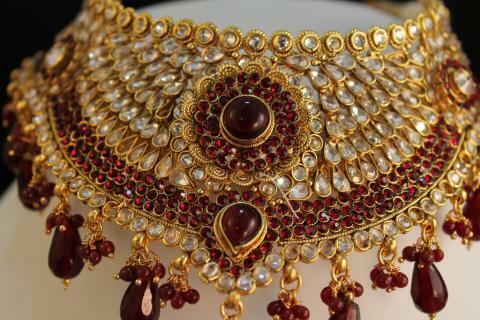 Heavy bridal traditional maharani jewelry set in antique gold finish and made from zircons, ruby red stone impression, alloy metal. This is a complete Indian bridal jewelry set and includes - necklace, jhumka style earrings, mang tika, jhoomar and ring. - Matching dangling jhumka style earring with push back closure and support strings. - Matching big finger ring. - Earrings/jhumke (one pair/2 pieces) max. length 4", max width 1.5" Support string 4"
This item in Bridal Jewelry category was first added to our catalog on 07-20-2014. 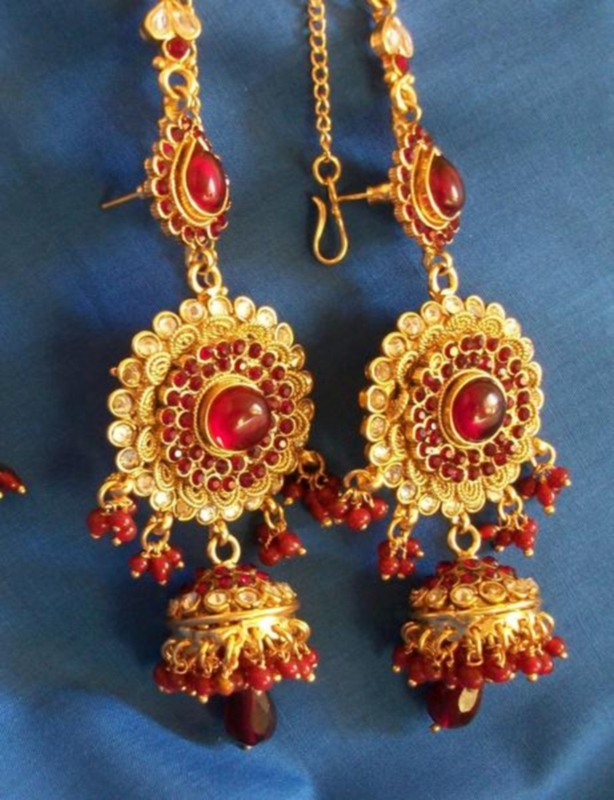 Buy Antique Gold Indian Bridal Jewelry Set - Zircons & Red Ruby Stone, sold & shipped by Shieno Boutique where you can shop online for Latest Sarees, Salwar Kameez, Shawls, Jewelry & Clutches. 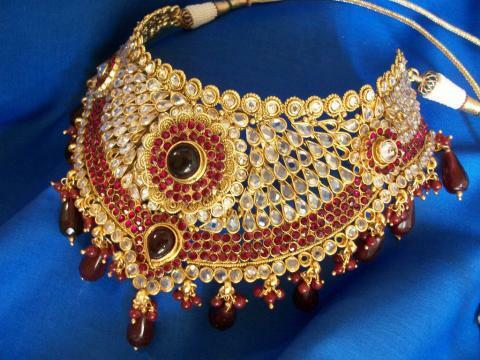 This Bridal Jewelry collection has been tagged as Jodha Akbar Indian Bridal Jewelry Set, Handcrafted Fashion Jewelry, Jhumka Earrings, Kundan Work, Traditional Wedding Ornaments, Indian Jewelry.